RIGHT CLICKing on a Playback Range will bring up the menu shown below. When entries in this menu are LEFT CLICKED the following additional useful functions will occur. Delete:- Removes the selected Playback Range block. Permanent:- Makes a Playback Range remain visible (in dark green if unselected and light green if selected) even if other Playback Ranges are created. Permanent Playback Ranges can be edited. 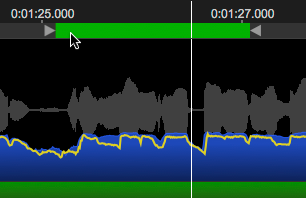 The entire Permanent Playback Range can be dragged by putting the cursor in the green block region between the end markers and the hand icon will appear as shown in image below. LEFT CLICK and drag right or left as required. Locked:- Makes a Playback Range Permanent and not changeable (unless it is first unlocked or deleted). A Lock icon will appear in the Playback Range. In the image below, we show a Permanent Playback Range (selected), a Locked Playback Range and a "normal" unselected Playback Range. When multiple Playback Ranges are used, the Up and Down arrow keys can be used to step along from the starts to the ends of each of these sequentially. The last two menu items above allow the user to set the Playback Start or End from the cursor position. This is particularly useful if a Playback Region extends beyond the screen edges. 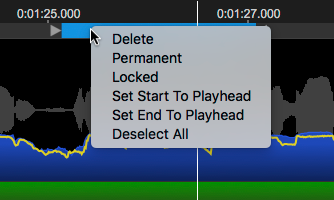 Set Start to Playhead:- Will reset the start of the Playback Region to the position of the Playhead. Set End to Playhead:- Will reset the end of the Playback Region to the position of the Playhead as shown below.